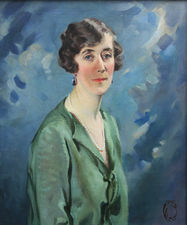 Dorothy Elaine Vicaji (1880-1945), was born of an Anglo Indian background, her father was the Indian painter Ruston Vicaji - Dorothy E. Vicaji was a very well known society painter who painted leading figures in the 1930s and 1940s. Her sitters included Madeleine Edison Sloane, Dorothy Duveen (daughter of the art dealer Lord Duveen), and King Edward's daughter, Princess Mary, Countess of Harewood. She exhibited both in London and New York.